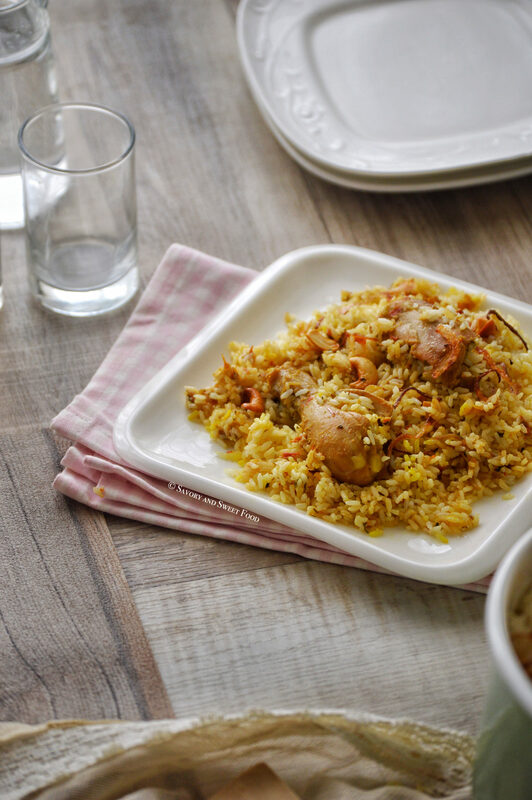 A family favourite, this delicious Chicken Biryani is a perfect dish to have on a lovely weekend. OH yes! And here I am finally with a biryani recipe after a loot of requests from you guys. I am really sorry, that I delayed this post so much. The truth is that I didn’t have the confidence to post one till now. I used to struggle with making biryani earlier. Have had a lot of flop stories with biryani before, especially the times right after marriage. But after many many trials, I think i have mastered the technique of making the perfect biryani. My husband is a big time biryani lover. So he always makes me prepare it on Fridays. And I used to start getting panic attacks on each and every Thursday night, hahaha! But all thanks to him, now I can make a decent biryani. 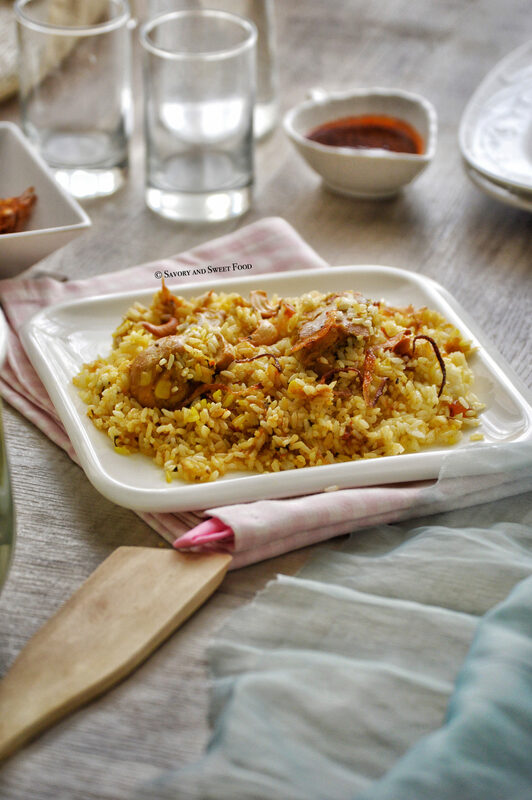 I have written some of the things to keep in mind to prepare a good biryani, in the notes. Don’t forget to read those carefully. 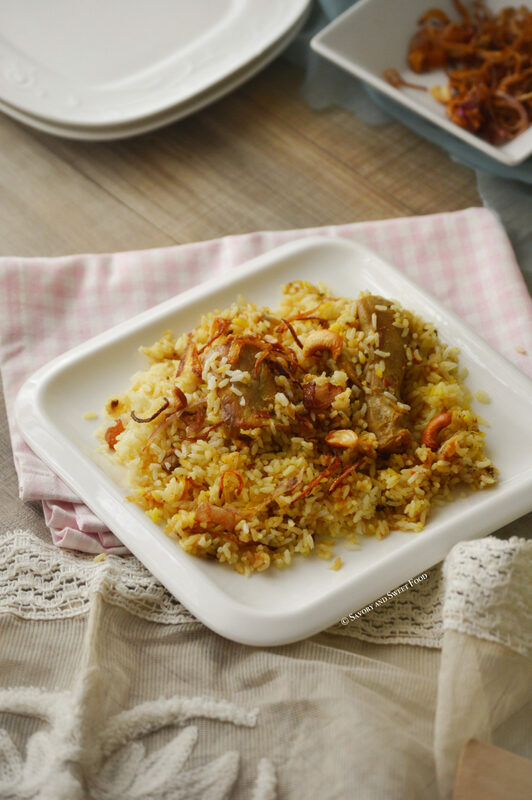 Try to get the perfect texture to the rice and the masala and you are good to go. The other very important thing is keeping the biryani for dum at very low flame. 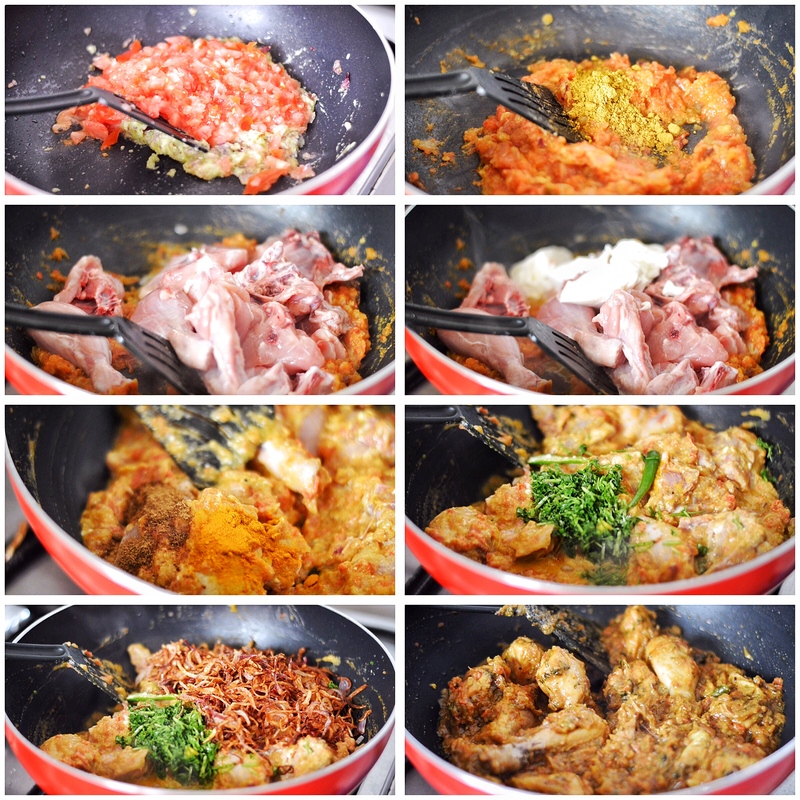 This is done to infuse the flavour of the biryani masala into the rice. At this point you can see that all the rice on top has curved up. The aroma that filled the house when you open the lid after dum is just amazing. 2 tbsp lemon juice, 2 tbsp water plus 1/4 tsp turmeric powder mixed together. Be careful not to burn the onions while deep frying. Keep stirring the onions in the oil. Take it out of the oil once it is light golden in color. The onions tend to get darker after you take it out of the oil. 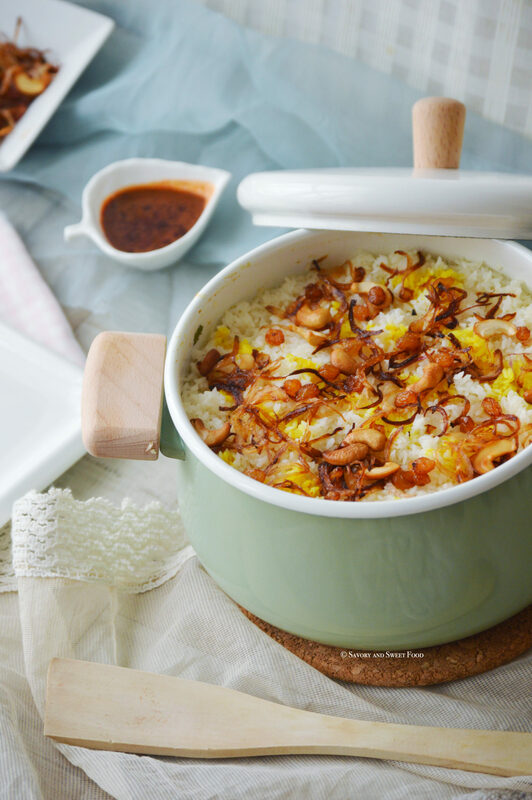 Usually when cooking the rice, the water required is double the amount of rice. But it varies depending upon the type of rice you are using. And also as the masala will have some moisture in it, the rice will absorb it evenly. If you use more water, the rice will get sticky and soggy. Always remember to cook the masala before the rice. The biryani masala should have minimal water. The masala should be quite thick, or else during dum, the rice will absorb most of the water and it will turn mushy. I have used a short grained rice named jeerakashala here, but you can easily replace it with the long grained basmati rice. Always remember, the better the quality of rice, the better the biryani will turn out to be. Deep fry the 2 sliced onions till golden brown and crisp. Keep aside. In the same oil fry the cashews and then the raisins. Keep aside. In a heavy bottom pan, add in the whole garam masala. Once it releases aroma, put in the chopped onion. Sauté till it gets really soft and golden brown in color. 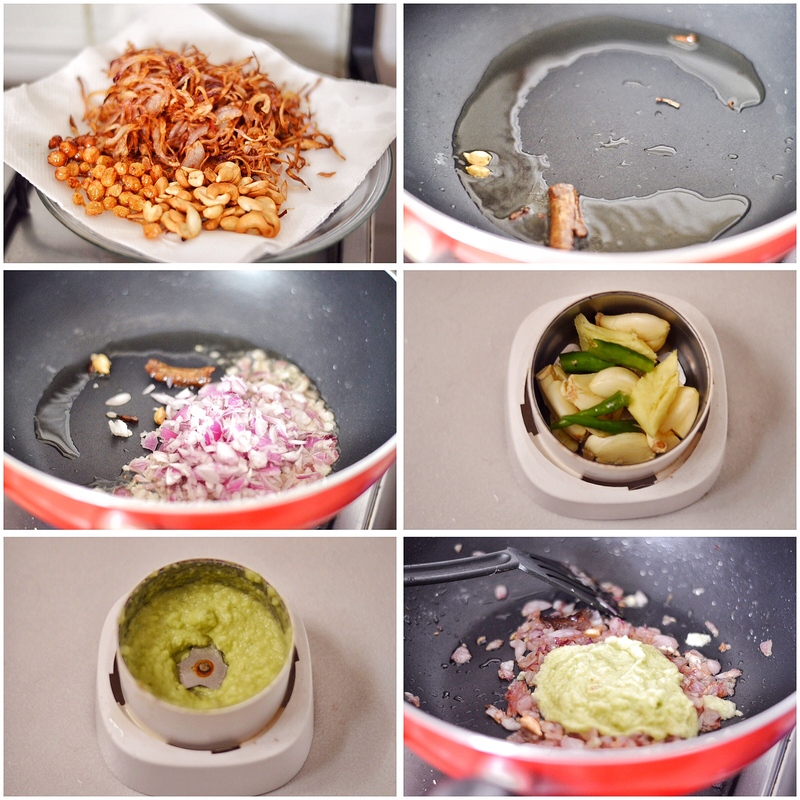 Meanwhile, grind together the ginger, garlic and green chillies into a paste. Add this paste into the sautéed onion. Stir around for a minute or two. Add the chopped tomatoes. Cook till the tomatoes turn all mushy and starts to leave out oil. Add in the coriander powder. Mix well. Drop in the cleaned chicken pieces. Add the yoghurt. Mix well to combine. Add the turmeric and garam masala powders. Mix well. Cook for 10 minutes. Put the chopped coriander leaves and about 3/4th of the fried onions. 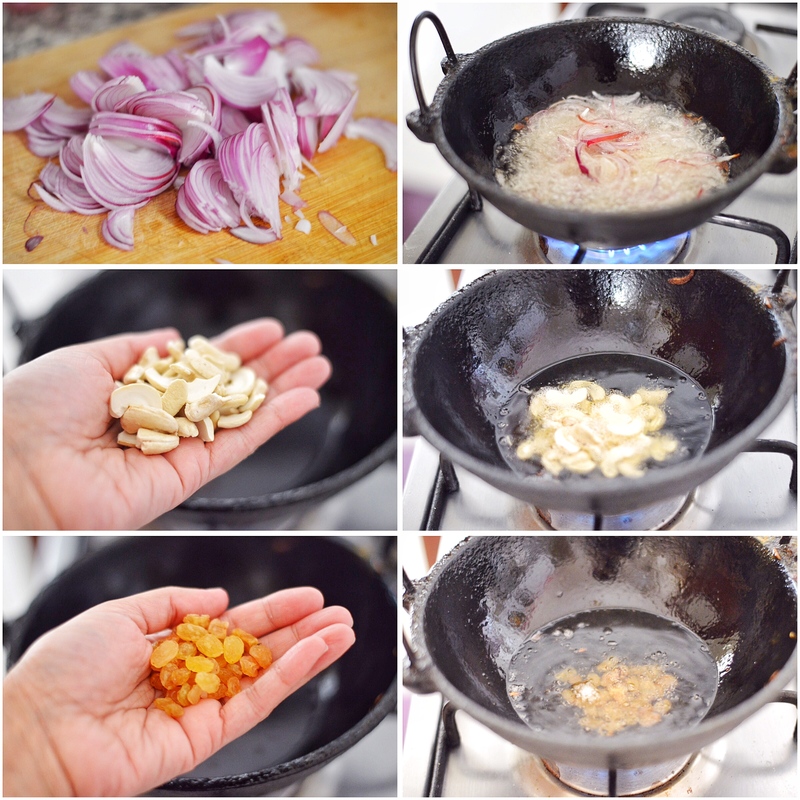 Crush the fried onions with hand before putting it into the masala. Reserve the remaining to sprinkle on top of the rice before keeping for dum. Mix well. Cover and cook for 15 minutes, stirring in between. The gravy should be thick. ( If you are using basmati rice, it would be better to soak the rice for 1/2 an hour). Fry the rice in ghee for a minute on high heat. Pour the boiled 4 cup of water. Pour in the lemon juice. Add in the salt. Let it boil on high heat till the water reduces. ( The water should be in the same level as the rice). Reduce the heat to low, cover with lid and cook for 10 minutes. Open lid and just stir the rice carefully. 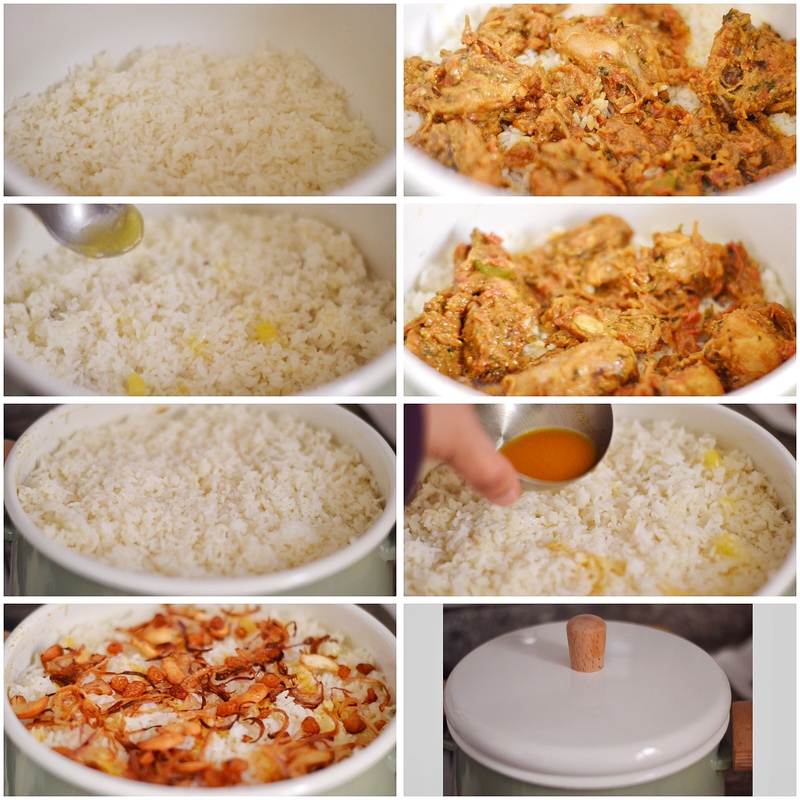 At this point, if you feel that the rice is not cooked at all and needs more water, pour in 1/4 cup more of water. Close the lid again and cook for 5 more minutes. Once the rice is cooked fluff up the rice with a fork or a large spatula carefully without breaking the rice. Divide the rice into three parts. In a pot, place a layer of rice. Then spread half of the masala on top. Again place a layer of ghee rice. 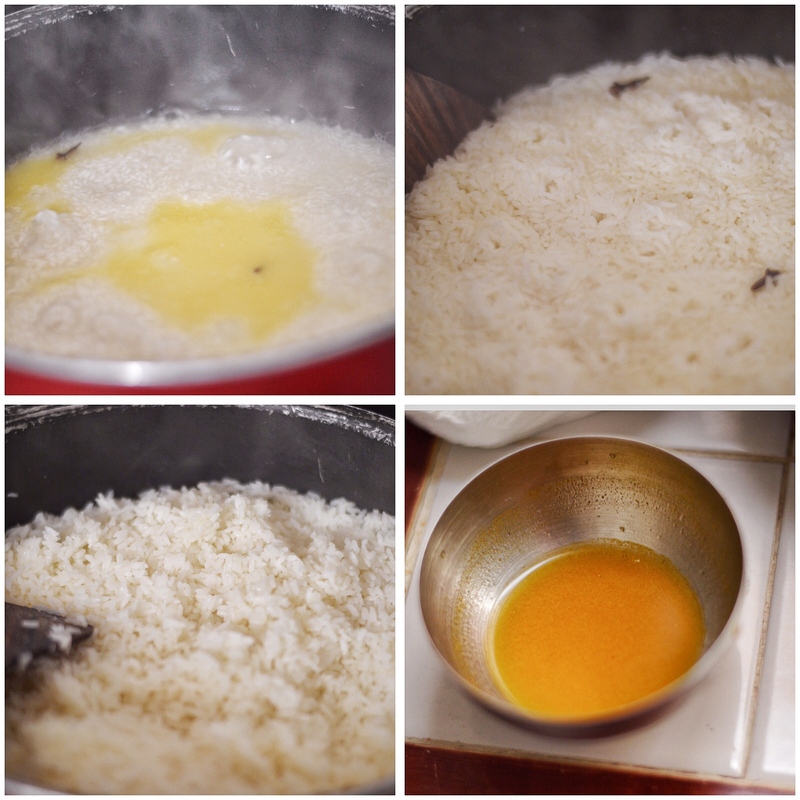 Pour few teaspoons of ghee all over the rice. Place the remaining half of the chicken. Then the final layer of ghee rice. Pour few teaspoons of ghee all over, then pour the turmeric and lemon juice mix for the yellow color evenly over the rice. Place the reserved fried onions, cashews and raisins. Cover with lid and keep for dum on lowest heat inside the oven for 45 minutes. If you do not have an oven, just cover the vessel with foil (to ensure the steam says in), then close the lid tightly. Heat a tawa on lowest flame possible, place the biryani on top and cook for 20-25 minutes. Make sure the heat is lowest both in oven and stove top or else the biryani bottom might get burnt. Let it boil on high heat till the water reduces. ( The water should be in the same level as the rice). Reduce the heat to low, cover with lid and cook for 10 minutes. Open lid and just stir the rice. At this point if you feel that the rice is not cooked at all and needs more water, pour in 1/4 cup more of water. Close the lid again and cook for 5 more minutes. Once the rice is cooked fluff up the rice with a fork or a large spatula carefully without breaking the rice. 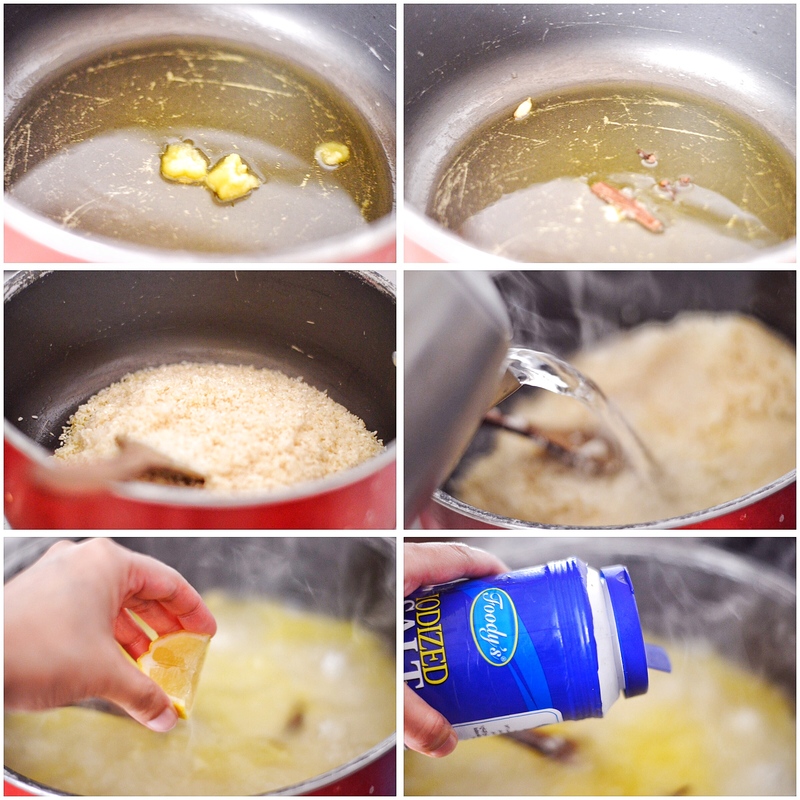 In a pot, place a layer of ghee rice. Place the reserved fried onions, cashews and raisins. Cover with lid and keep for dum on lowest heat inside the oven for 45 minutes. If you do not have an oven, just cover the vessel with foil (to ensure the steam says in), then close the lid tightly. Heat a tawa on lowest flame possible, place the biryani on top and cook for 20-25 minutes. I have used a short grained rice named jeerakashala here, but you can easily replace it with the long grained basmati rice. Always remember, the better the quality of rice, the better the biryani will turn out. 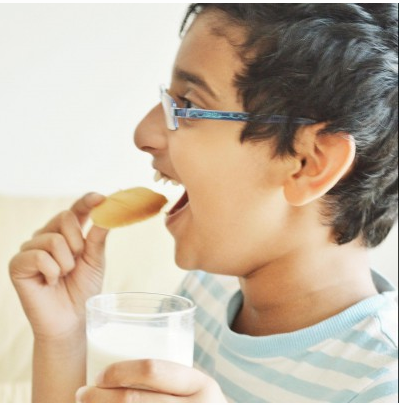 Please do give this recipe a try and let me know how it turned out for you Aysha. I would love to try your version of biryani sometime. It is medium spicy. If you want it less spicy, reduce the amount of green chillies used. 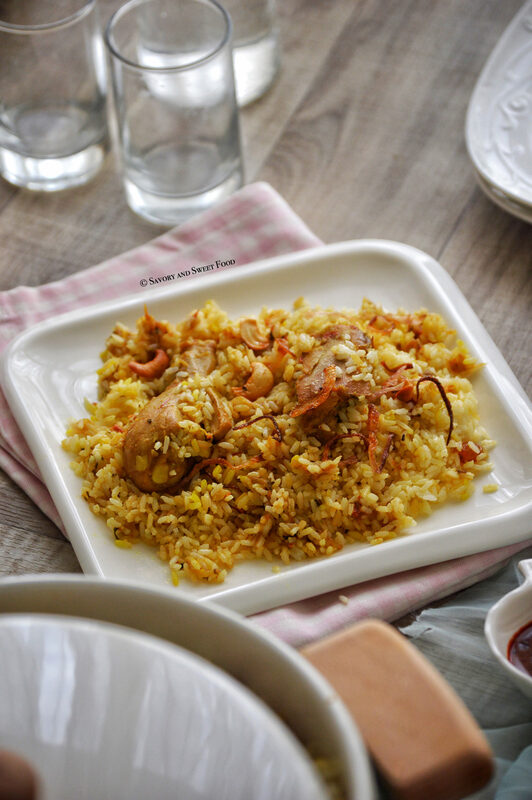 This is the perfect Biriyani ever!!! Looks so close to the Thalassery style! I somehow prefer my biriyani with basmati, though jeerakashaala is preferred to make neichoru or Thalassery style biriyani. Haven’t had chicken biriyani since ages thanks to my current diet, the plate looks so tempting, and I love your dum chatti… so cute! Thanks Rafeeda! Yess, this looks like a thalassery biryani. Maybe because of the jeerakashala rice. 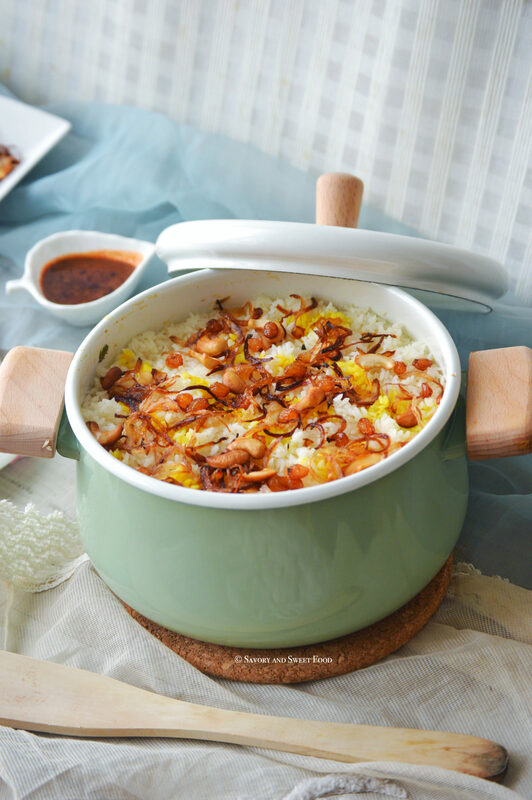 My husband loves this rice more than basmati rice. So I make biryani mostly with this one unless I have to boil the rice and not make ghee rice out of it. Friday’s are always reserved for biryanis at my place. I know it takes time to master the biryani but once done it becomes easiest thing to prepare. Exactly! It really took sometime for me to get it right. But Alhamdulillah now I learned and it is really easy. How i missed this Sadia!Looks Classy!we used to add lots of onion in our masala…it sounds yum!As usual clicks are just woow and tempting! Thanks a lot Shazia! I make biryani with lots of onions too sometimes. 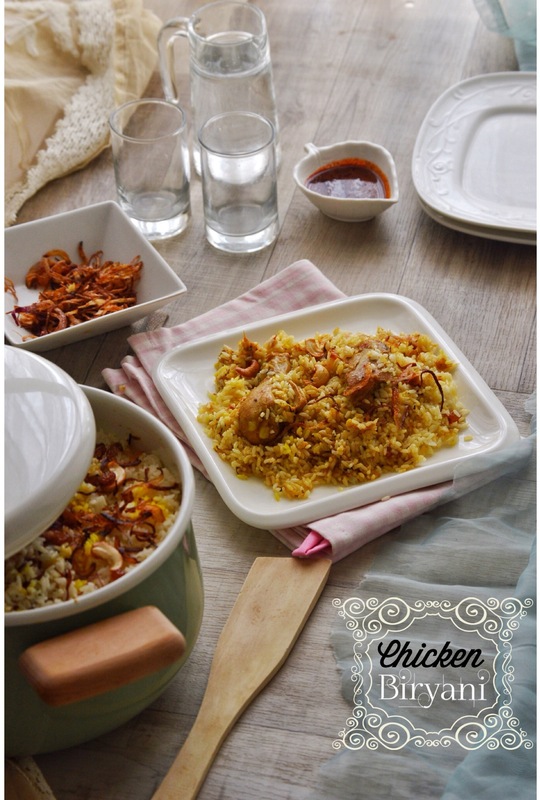 Wonderful biryani and love chicken biryani, I always make them on Fridays ,as a norm for excuse . But actually we never get enough of our biryanis . That’s actually true. 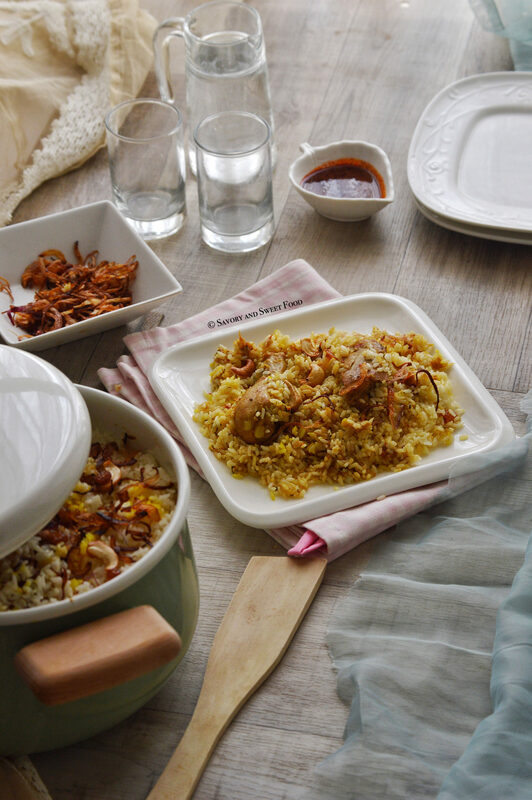 We never get bored with biryani. Umma is visiting Aati this Eid so I”ll be cooking this time. Aaalll the best Nauree! Don’t worry, this is not Thalassery biryani. It’s easier I guess. You will get it right, in shaa Allah! Let me know if you have any doubt okay. What kind of pot are u using here? What is it made of? I am very sorry for replying so late. That is a pan made of enameled steel. I got it from IKEA.